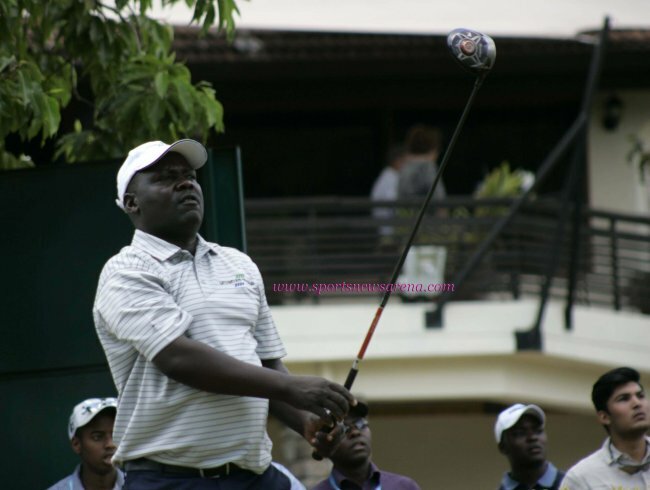 Kenya's Dismas Indiza is the top placed kenyan at the Barclays Open. South Africa’s Haydn Porteous has pulled out a narrow two stroke advantage at the Barclays Kenya Open after a second round 65 saw him post 13 under par at the Karen Country Club on Friday. Dismas Indiza continues to fly the Kenyan flag as the highest placed local representative, and he is in a tie for 14th at six under par thanks to a second consecutive round of 69. The 46 year old is one of three home favourites to qualify for the final 36 holes, and alongside Brian Njoroge and Matthew Omondi, who both made the cut on the mark at two under par after rounds of 68 and 71 respectively, will carry the hopes of a nation over the weekend. The 20 year old, once ranked as his nation’s top amateur, is just ahead of overnight leader José-Felipe Lima thanks to his seven under par score on Friday and the fact that he has only dropped two shots over the opening 36 holes. Couple that with 13 birdies and an eagle at the par five third hole on day one, and it is easy to see why the former South African Amateur Champion is out in front, as he looks to secure a victory that would earn him full playing rights on the European Challenge Tour for the first time. “Whenever you shoot 65 it’s a very good day out there, even though I had a bit of a shaky start after starting at the tenth, but then I drove the green at the 12th and two putted for birdie," said the man who made it through the first two stages of The European Tour Qualifying School last year, before missing the four round cut at the Final in Spain. "Then I made a silly bogey on the par five second, but bounced back at three with a birdie, and although I missed two short ones on four and five, I made a good birdie on seven. It was also nice to close with a birdie at the ninth, as that leaves a sweet taste in my mouth. “I got off to a slow start to the Sunshine Tour season this year after a few swing changes to try and become a bit more consistent, because four rounds is a lot of golf at this sort of level, and I wanted to play better over 72 holes. “I just thought a change needed to be made. I didn’t want to miss cuts, then play really well. I wanted to find a happy medium, and it is starting to pay off. I’m hitting the gym and working hard on my golf swing, so it brings a bit of confidence now." The third round will see Porteous have to deal with the same issue that faced Lima on day two, a fact known throughout the golfing fraternity, which states the difficulty experienced by so many in following up a good score with another the next day. For the second placed man from Portugal, though, he fared better than most on that front after an opening eight under par score had seen him carve out an early two stroke advantage of his own after 18 holes. Five gains and a mere two bogeys saw Lima sign for a 69 on Friday and post 11 under par, as he continued the impressive form he has shown this week, in his first tournament since back surgery last September. “It was a good round and my long game was better than yesterday,” said the 33 year old born in Versaille, just outside Paris. “I three putted on the 18th for bogey, but without that, I played really well. I gave myself plenty of opportunities to make birdies, and three under was pretty good, as I am in contention going into the weekend. Another South African, Brandon Stone, is in a tie for third on nine under par alongside Frenchman Cyril Bouniol, who finished 19th on the Challenge Tour Rankings last season, and Dutchman Daan Huizing who graduated in sixth place two years ago. The trio carded scores of 66, 67 and 68, respectively, and are ideally placed heading into the weekend in Nairobi. One shot further adrift is a chasing pack that includes Louis De Jager (67), also of South Africa, Finland’s Jaakko Makitalo (68), Frenchman Victor Riu (67), the Swiss player Damian Ulrich (69) and England’s George Woolgar (66), who are all tied for sixth.